I don’t think I’ll be taking any new photos any time soon. I don’t feel up to it, I’m very sad and disappointed in my abilities and life in general I suppose. Maybe it’s just that I need this period in which my head does nothing but ruminates with all sorts of memories connected with the person that has been by my side for as long as I remember and is now gone, or maybe I’ve just had enough of useless battles that I can’t possibly win. Sometimes it took me all the energy in the day to produce several photos that I considered good, which in turn ended up being more than average in comparison to what I could see in numerous blogs here and places elsewhere which discourages me in no time. Sometimes in turn I think that the only things I know how to do somewhat well or I actually want to do is write about something, take photos, draw, grow flowers… but I’m not great at any of these things nor they can secure me some living. Yet without them I don’t know who I am at all, now more than ever I feel extremely lost in this life. On the day my father died, I ran out of paper to copy some documentation Mr. very efficient undertaker required for the funeral. I was totally lost and confused as where to look for paper in such a situation, and my mom opened the right drawer and said “Here you are”. No, not that paper, those are some old photos wrapped up in an old office paper cover, I replied. Oh I am sorry, she said and brought me the right pack I needed. When the undertaker left, I wanted to put the photos back into the drawer but instead I sat on my bed and took them out to see what was inside that cover. Those were the photos I took while still attending an unsuccessful life episode at an art college where I had among other things one semester of black and white photography. I used my dad’s old camera and another one of that old generation that we bought together at a photo fair, I loaded them with films for black and white photos and later personally developed those films and produced photos in a dark chamber at the college. For the end of year’s exhibition I had two collection of photos – Belgrade – buildings vs. nature and Belgrade cemeteries’ tombstones. They had some success, but in the end it all ended up covered with dust together with everything else in my life. I knew more or less what I was to find in that cover and it disturbed me, yet I put my hand inside and pulled out the first photo. 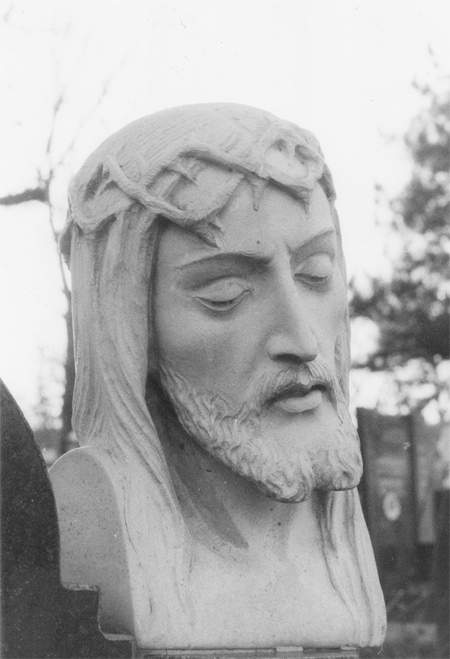 Strangely enough, it was a photo of Jesus from one of the tombstones. It made me shiver and cry all right. 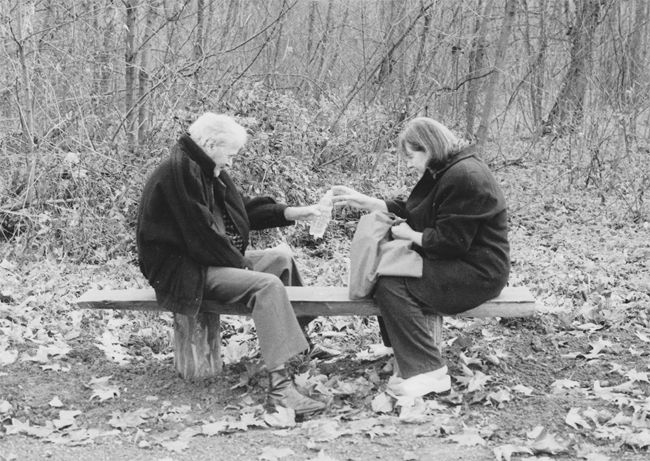 The second photo after Jesus was this one – mom and dad sitting together in one of Belgrade’s beautiful memorial parks, dad smiling and passing a bottle of water to mom. There is some very positive special atmosphere trapped in that photo taken 9-10 years ago, yet it seems that decades have passed since those very special times in which we were a much happier family. This photo is special also because it was taken after my quite impressive recovery from the second violent PD outburst, while my dad still had both nerves and strength to drive me out everywhere to conquer agoraphobia. At first it was quite hard to go to these lessons, but he would drive me and even wait for me, I think that he was glad that I grew more and more interested in photography. It was one hell of a job for me to prepare those films for developing, because that is something that must be done in a room without even a single shadow of light. You have to open the camera in total, absolute darkness, take the film out relying only on your touch to guide you and insert it into a developing vessel so that you don’t miss its guides that separate layers and layers of film from one another without seeing a thing. When the film is properly inserted into the vessel and properly guided in concentric circles, the vessel has to be tightly fastened with a lid and only then you can come out into the light again. Should I mention that this procedure is among the worst anxiety sufferers’ nightmares? You’re trapped until the end of the procedure in total darkness. You don’t see a thing, no matter how hard you try to open your eyes. Trapped plus temporarily blind plus scared of destroying a precious film, equals panicccc… usually, in other situations you can run away and retreat even if it means to embarrass yourself. Running away from such a situation would mean opening the door and exposing the film to the light, which in turn means… bang! and all your work vanishes into thin air. I remember tons of panic and I remember how it subsided, slowly but definitely with each new film I took out of those cameras. The joy of seeing good shots that I captured would eventually overcome the pains that were needed to get me to that place. So, all in all… this photo is in memory of my dad, but it’s not only that I took that shot, I carried out the full process to it’s end – developed the film, bought the paper, worked in the dark chamber to expose the paper to the necessary light to get this picture, put it into developing and fixing solutions and left it in the dryer till it was ready for others to be seen. Now it was scanned and turned into pixels, I’m just sorry that I don’t have a better scanner. I shouldn’t complain, because how things are right now it is highly improbable that I’ll see another one in a very long time. I hope dad is happy somewhere there where he is now, smiling like this. And I hope he’s less lonely than mom and me. His favorite gardening magazine arrived today, it was very late this month. Too late as it turned out. We were at the cemetery today and we carried it with us. Unfortunately, there is nobody to read it any more. It was the 4th time that I went to that grave in 10 days, but it still doesn’t seem real. I still think with some corner of my mind that he’ll appear from somewhere and wake me up from this nightmare, even though he died on my very hands. Then another morning comes and my stomach that turns into a painful knot reminds me that there is no waking up from this reality. It’s too damn hard… dear God, help me find some way out please. I love the photo of your parents. Take care, my dear friend. Thank you so much dear Judy… I’m not felling well at all, there is so much going on in my head and so many painful things to resolve when someone passes away, but I constantly think of you and Jim, you two are wonderful and kind souls and your support is truly precious, unfortunately I don’t have much support these days in my life at all so each word from you is extra special. I’m just scared that as I don’t manage to squeeze out of myself almost anything positive these days, it would be simply too much negativity for you guys to endure, it’s not fair. It seems that all I have to talk about are sad and bad things, and I would so much love to sound differently and inspire instead. But believe me, it’s as though life lost all colors. I look at them and I don’t see them, it’s as though I’m numbed and there is some filter between me and the things that surround me – I recognize those feelings well as they are not so new to me and they are pushing me back to where I used to be, but I don’t know how to solve that. I simply don’t know how to live in these new circumstances, it’s something I wasn’t prepared or actually fit for at all. I just go around automatically and nothing seems right. I would give my best to bring the sky down if needed if that could bring dad back as I’m sure everybody who lost somebody very dear would try to do, but there is no going back. All I can do is continue the road, but I don’t know how to walk this way. It is sad and scary. Let’s hope it will get better with time. I wanted to write an e-mail, but it would be all these same sad, hard things, it doesn’t seem like a good way for you to get to know me. As I sad in reply to Jim, I do wish you guys got to know me earlier, I used to fight quite well lately in spite of all my hurdles, at least I thought so. Anyhow I’m still here for e-mails if you feel up to it and I’m here for you for whatever you might need, this bad state of mind I’m in will never interfere with that. Thank you very much for reading and caring, take good care of yourself my dear friend, and enjoy each good moment to the fullest – I wish I knew to appreciate mine better while they were still there in my life. I would love to see more photos on your blog. It great to know that you would like to see more photos, I just don’t manage right now, I’m very sad and I cried a lot today, everybody here seem to be pushing me to take over dad’s responsibilities, and I can’t manage even with just my own… it’s so very hard. Yes life is sometimes very hard. I know that myself. I really sorry that you had to experience hardships as well, but I do hope for better days for you, you deserve it. For many years my each and every day has been a struggle of some kind, life has never been easy on me, now I have all I used to endure plus a very bad life blow. I had another pretty bad panic attack the previous night, it was horrible. But that’s my cross and my curse I suppose, there is no other life for me. Hang in there and I truly wish you all the best. I wrote my reply to your previous comment before I read this post. I stand by my encouragement to you to take pictures and post them. This post is interesting. The first paragraph is, to my eyes, all defeat, anxiety and hopelessness but the remainder of the post is the total opposite. I like the remainder. I like the hopeful, “I did this” attitude of the remainder of the post. You did do it. You took those good pictures and you have them to share and remember. Clearly your father supported you in the endeavor you describe in the second paragraph. And the third paragraph, your memory of a successful, yet challenging, endeavor. Yes! Come on Tanja. Do it. Take some pictures and share them. Who cares if they are great pictures? Seriously! Who cares? Just take them and put them out there. It will do you good. And I think you will find that you are actually putting out good pictures anyhow. Just don’t worry about that part. It is the taking and sharing of them that matters. I did not know him, but I suspect your father would have agreed with me on that. So thanks for sharing the picture of your parents and thanks for sharing the picture of Jesus. I’m looking forward to whatever you choose to share next. Hello there again, I wrote in that previous answer about how hard it is to make photos right now… but I was also thinking about something else, how life is strange and how it can be short, you never know when your time can come – and I have so many photos on those half-dying hard discs that nobody ever saw. The idea that somebody will simply trash this computer if I am gone disturbs me for some reason in the sense that it contains stuff that should better be shared instead of wasted for good. I’m still not feeling all right at all, or maybe I’m feeling even worse than before, but let’s hope for some better days in which I’ll manage to share what I still could offer to the world. Thanks so much for the encouragement, don’t think that it fails if I don’t manage to come out here, it is the heavy depression block, but I hear every word you say. I need the encouraging words more than ever, and it is really good to hear that energy from over there… it will have to crack that wall of mine some day. Maybe it is also that I actually “don’t want” to be happy again – being happy and detaching myself from what happened feels like abandoning dad, forgetting about him and I would still want him to be present in my reality, at least in my constant thoughts which is painful, and the vicious circle continues to spin. But that is I suppose all part of the grieving process, I don’t think there is a magic way to speed it up, until you somehow come to terms with new circumstances. I wish I knew what my father wanted me to do right now. I know he disliked many of my choices in life (the choice of my studies, how I liked to dress myself, my views on “what life “should” consist of”, my dislike for imposed rules, my fascination with distant cultures, spending hours in front of a computer or TV screen etc. ), but from this lonely distance, I can see that in quite a lot of those things he was right. He was talking from a standpoint of long life experience and he was looking ahead, thinking of what could be good for me in this country’s reality where I have to live. And I never truly fit in here for some reason, it’s as if somebody pulled me out from somewhere far away and planted me onto this seemingly wrong soil – I was always much happier when I still could travel, I always feel better on the internet or watching anything foreign on TV… even my thoughts that flow in my mind almost never flow in Serbian, and it just all adds up to confusion in my life. I was always with my head too much “up in the clouds” for my dad’s taste. I don’t think he was that wrong at all. I won’t be going back in a dark room any time soon – will leave it to the experts, but I commend your ability to work with it and succeed, despite not only the practical difficulties, but the need to work through the fears it brings you. Thank you very much – yes, I succeeded but it was really difficult and challenging. However, I didn’t waste a single film and I did have quite good shots for a beginner, which is pretty amazing. It was all done back in 2004/05, since then I haven’t done it any more – partially because it requires special films and special conditions, chemicals, vessels and there is no more access for me to that quite nice room where photos were produced, partially because of the fact that I stopped going places, so shooting photos kinda lost meaning. I’m not sure I’ll ever be in a dark room again, but it could be fun to try – I’m sure dad would have fun if he could participate, he used to love photography very much when he was younger.